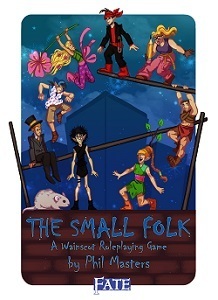 The Small Folk is a tabletop roleplaying game by Phil Masters, self-published in 2015, which uses a version of the FATE Game System (under the terms of the Open Gaming License). The setting material is an expanded and adapted version of a chapter which appeared in Dreaming Cities, a supplement for Guardians of Order's "Tri-Stat" Game System, which appeared in 2005 before Guardians of Order went out of business. Cover and interior art (new for this version of the material) is by Steve Stiv. The game is described as "Wainscot Urban Fantasy"; it is set in the modern world, but the PCs are "Small Folk", (very) tiny humanoids who live behind the walls and in the undergrowth. They are descended from The Fair Folk of legend, who were in fact psychic projections of the human racial unconscious, but they were always small, and now they have gone into hiding as the world has moved on. They live largely by scavenging the by-products of human society. Small Folk society is divided into seven "cliques" — boggarts, brownies, goblins, gremlins, knockers, pixies, and sprites — who like to think of themselves as distinct species, but who are really just socio-cultural groups. This doesn't prevent them from engaging in a little Fantastic Racism. There are also a few "cliqueless", because some people just never will fit in. Each clique has a couple of magical "charms" — special abilities that they call their own. Campaigns can involve preserving secrecy, engaging in small-scale politics, investigating mysteries, or conditioning young predatory animals not to attack Small Folk. The game is sold in digital form from the "Warehouse 23" online store. Beneath the Earth: Living underground is one option for the Small Folk, and knockers have magical abilities that assist them in digging tunnels. Busman's Vocabulary: Brownies tend to talk in a parody of human business jargon all the time, if the Game Master or players can sustain this. Character Customization: Handled by Aspects, choice of Skills, and Stunts. Clap Your Hands If You Believe: Probably the origin of the Small Folk — they are said to have originally been created by human belief — although nowadays they reproduce in the more conventional biological way. However, they do still disappear in a puff of smoke when they die. Fairy Companion: Small Folk are supposed to shun human attention, especially these days, but there are hints that some human "magicians" actually used to have the aid of one or more of these beings. Fairy Tale: Invoked with some irony. The cliques and many of their abilities and magical powers are derived from fairy stories and folklore, but with a humorous or modern twist. Goth: Boggarts are a parody of this trope, in all its potential variations (though few of them are very perky). Griping About Gremlins: Played with, in that there is a clique of gremlins — but they are generally more interested in doing cool stuff with technology than in sabotaging it. Hand Wave: Fate points, which are normally used to as a game-level device for influencing the story, also power more dramatic uses of magic. This is handwaved with the idea that magic runs partly on how significant the user is to the universe, somehow. Hip-Hop: The goblin subculture is a parody of this trope, complete with a lot of breakdancing. As goblins aren't a distinct ethnic group, the overall effect is kind of Pretty Fly for a White Guy, at best. House Fey: The brownies used to fulfil this role, and their magical tricks still reflect that tradition, but nowadays they're a bunch of yuppie wannabes. Lilliputians: Small folk are 5-10cm (2-4 inches) tall. Little People: Very little people — actually Lilliputians — are the point of the set-up. The Masquerade: The Small Folk preserve the secret of their existence from humanity by dint of being very small and having some appropriate magical powers. Mouse World: This is one of the handful of RPGs which tackles this sort of story. New-Age Retro Hippie: Sprites — nature-loving flower fairies with a taste for hallucinogens — embody this trope. Pixies also tend this way, but they are more caricatures of more modern scruffy impoverished alternative-lifestyle radical-environmentalist "crusty" types. Members of either clique may be played as Granola Girl types. Our Fairies Are Different: They used to be very traditional, but they've had to adapt to the modern world. Our Goblins Are Different: Goblins are one clique among the Small Folk. They aren't especially evil, but they are aggressive and angry, with an attitude, and often wear baseball caps (back to front). Parody: An Urban Fantasy game about supernatural creatures, living among humans but hidden from common knowledge, whose society is divided into a number of rival groups. Remind you of anything? Scavenged Punk: The Small Folk scavenge a lot of discarded human stuff, which shows up in the game's visual imagery from time to time. Urban Fantasy: Not all Small Folk live in human towns or cities, but most find it convenient. Wainscot Society: Very much the nature of the Small Folk's world. Working-Class Hero: Knockers see themselves as fitting this trope, and are very assertive about it. X Called; They Want Their Y Back: The intro fiction features the line "The sixties and the nineties called and they want their dialogue back" — lampshading the fact that some of the cliques are rather heavy-handed parodies of rather dated subcultures.